Hi, I am interested in your 1968 Chevrolet Chevelle SS listed on Autotrader for $38,500. I'd like to get more information about this vehicle and confirm its availability. 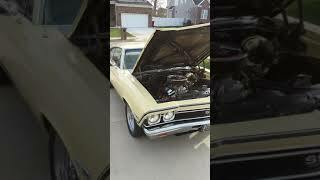 For sale, #s Matching 1968 Chevelle SS 396 2-door Butternut Yellow hard top, mostly original car with modern upgrades, true 138 VIN #s Matching 396 L34 Big Block beast with 3-speed Turbo-Matic 400 column shift transmission and 12-bolt rear. Amazing speed and balance on the high-way and true pleasure to drive around town! Drives better than new, has power steering, disc brakes and bench seats. Frame-off restored with completely upgraded suspension and engine components, long tube headers, intake manifold, holley 750 carb w/auto choke, pertronix ignition, belts, hoses, shocks, traction bars, new springs, new fuel tank, Pirelli tires with Cragar Mags, high pressure oil pump, added gauge cluster, performance cam, original color exterior and interior-gold, new glass and seals all around, everything works, powertrain is immaculate, too many other upgrades to list! Drive this car as often or as far as you want, flawless mechanically, paint isn't Concours but it still shines and no rust! Have original intake manifold, some new vinyl door panels that were not needed and original AM Radio, car currently has an 8 track player installed. Oak Ridge Boys and Rolling Stones 8-tracks convey! Time for someone else to drive and enjoy this beautiful 50 year old classic! Price $38,500.00, no trades, serious inquiries only, no third party sellers.